BEHZAD RANJBARAN (b.1955): Flute Concerto, FRANK TICHELI (b.1958): Clarinet Concerto, BRAD WARNAAR (b.1954): Horn Concerto. 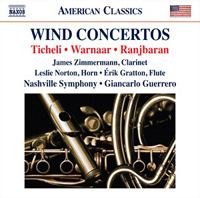 Description: This is the original full-orchestra version of Ticheli's hugely appealing concerto in three movements, paying homage to Gershwin, Copland and Bernstein, with plenty of stylistic allusions (and amost-quotations, some of them deliberately set up to toy with the listener's expectations ). The first movement is a rollicking allegro full of jazzy syncopations; the second an atmospheric, open-air lyrical song, and the third a quirky, unpredictable romp, restlessly energetic and full of gestures that seem to have strayed in from West Side Story. Warnaar's concerto is very neo-romantic in structure and content, with an easy-going popular element carried over from the composer's 'day job' composing and arranging for the film and entertainment industry. The first movement, 'Tintinnabulations' is energetic and minimalistically propulsive; the slow movement is a subdued, elegiac lament, and the finale a tarantella with jocular intrusions of repertory pieces for the horn in a kind of 'trash talking' exchange between orchestra and soloist. Ranjbaran's piece is also a three-movement, neo-romantic concerto in the western tradition, but on a larger scale, tonal like the other works here but constantly inflected by the rhythms, colours and melodic contours of Persian classical music. The work sets up oppositions between driving, dramatic music (rather Prokofiev-like) embellished by fast, virtuosic music for the flute, and sensuous, exotic material in which the flute emulates the sound and techniques of the Persian Ney. Érik Gratton (flute), James Zimmermann (clarinet), Leslie Norton (horn), Nashville Symphony; Giancarlo Guerrero.